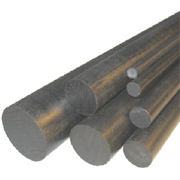 Steel bars fulfill a large number of uses. Because of its intrinsic strength, which stems from its circular cross section. Round bars offer universal applications where Omni Directional strength is of premium , especially in the re-inforcement of concrete. Dia(mm) x Dia(mm) x 0.0019 = Weight/Foot.